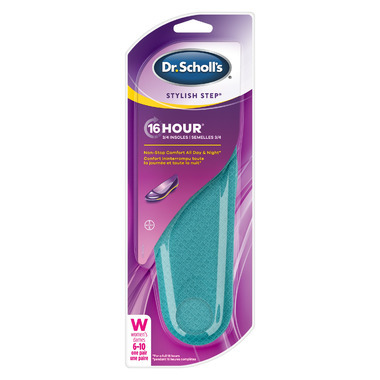 Dr. Scholl's Stylish Step 16 Hour Insoles provide 16 hours of non-stop comfort. They fit comfortably into work and casual shoes. Cushioning zones provide superior* cushioning and shock absorption. Top cloth fabric helps keep feet cool and dry to prevent foot odour and wetness. Slim 3/4 length design that fits comfortably into most shoes and won’t crowd toes. *versus not wearing insoles. I like these insoles. They're very cushiony, and feel nice on your soles. At the end of a long day of walking around on these my feet still hurt a bit, but when I wear no insoles at all, I can barely walk at the end of a long day. So I would still recommend these.